As I get more and more exhausted, I find it harder to type much on this little iPhone. But I see so many things I am anxious to show you! I can't control where the photos end up on the blog post since I am not at a real computer so I hope you can bear with me and figure out what matches up with what. Everyday the girl wears a different dress and gets painted differently! 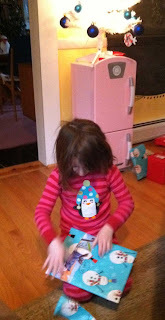 Today she had a dress with lips, so her arms had lips, her necklace, socks, and boots were all painted on too! The paints used are new body paints from Tulip. Tomorrow will be an Egyptian theme! 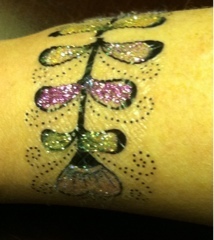 I was wearing my tangle body stickers and stopped in the Art Glitter Institute booth where she glittered me up with new skin safe glue and glitz. 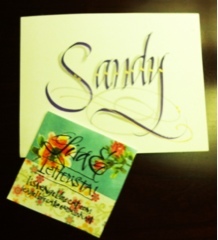 I had my name written out beautifully by Lisa Engelbrecht. 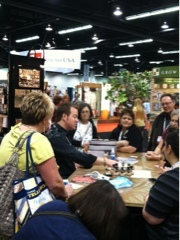 Watched Tim Holtz charm the crowds of women. I met Marie Browning. 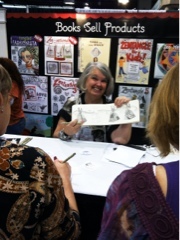 Watched Suzanne McNeill demo her tangled stencil designs. (notice my books on the wall behind her?!) 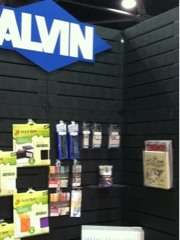 I saw my books on the wall in the Alvin booth too! 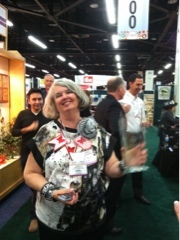 There was a party that evening in the DO/Fox Chapel booth to celebrate Suzanne's Industry Award. Here's a bunch of pics from that too. The one with two champagne glasses is my mom. I'll have to add names to the pics when I get back home. Tomorrow is my demo day in the booth so I need to get to bed ASAP! 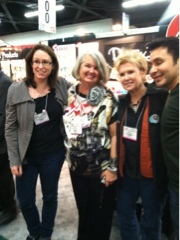 I just got back from dinner with Suzanne McNeill and Cindy Sheperd (and my mom). We laughed a lot and I talked too much and too fast... It's funny how I can be hyper and exhausted at the same time. But it is impossible to spend the day looking at cool new art tools, amazing displays, and talking with fascinating people... and not start generating ideas at a supersonic pace! I had a lot of fun chatting with Stacey from James Button and Trim about designing custom buttons. 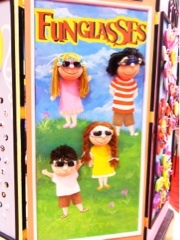 (see the picture with the cute sunglasses). 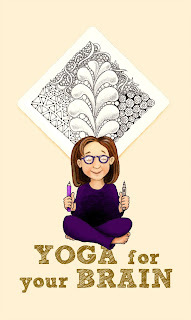 And Joanne Fink- who did the Zenspiratons book, is a licensing coach and I HAVE to go back to talk to her again tomorrow! I met a lot of designers who do the demos and create samples and projects for different companies. I got a really cool wheeled cart from Tutto luggage. In purple! And, and, and...! Oh, I need to go to bed... But first I have to look through the pile of catalogs. I wonder if I should restart my stamp company... Or kids clothing... Or make stuffies....? My brain is way too excited to sleep! We spent most of today driving around Hollywood and Studio City with my baby brother, Dave. The bestest part was visiting his office. 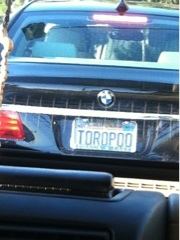 Big woop, right? 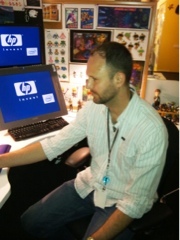 But my brother works as the assistant art director for game development at Neopets. Which is owned by Nickelodeon and MTV. He gets to draw amazing creatures and color them and play games all day. In a very cool office. 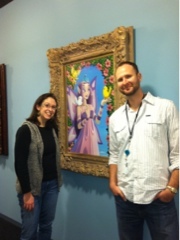 One hallway had paintings he had done of some of the characters all hanging in fancy frames. 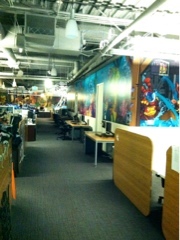 The enormous room full of cubicles where the artists work had a giant mural running all the way around the room. 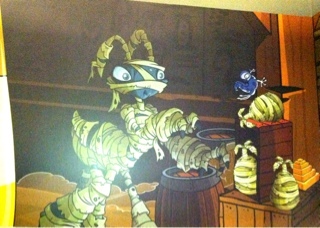 Dave had combined all the different Neopets characters into storylines and printed the art onto vinyl. 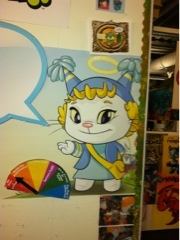 Some of these characters were so cute I had to zoom in and snap their pics! I couldn't take any pictures of his current projects, but his computer is a tech geek's drool fest. He has an enormous Wacom tablet that is basically a giant touch screen, and then a second screen just to see the artwork. 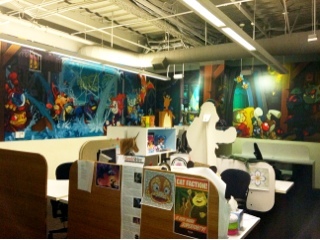 All the cubicles are filled with toys! The break room has every kind of gaming device and giant TVs and comfy chairs... The downside to this heaven- yes, there is a downside- he can spend ages working on a very cool project just to see it canned for some minor detail. It just disappears into a file drawer. He drove us around pointing out all his favorite haunts and laughing at the tourists. My heart skipped a beat when I saw a giant Kermit the Frog on top of a pretty brick building. 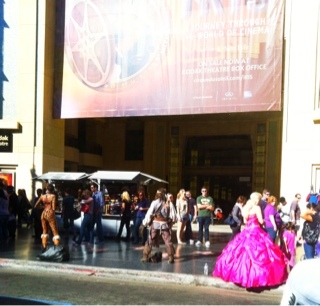 When I gasped, he casually said, "oh that's the Muppet's Creature Workshop". Ahhhh... Someday, I want to go in THERE! Isn't it amazing how things can seem to go wrong, and yet fate or serendipity is really working over time? Snowstorms kept schools closed the day we flew out and also caused delays for the flights coming in to the airport. 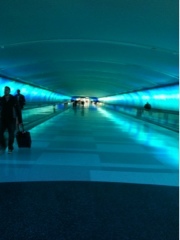 Before we had even left the ground we realized we would miss our connecting flight in Detroit! Our replacement flight was a few hours later so we explored the airport. It's actually quite a lovely airport! I was surprised. There was an underground people mover that changed colors and played relaxing sounds like the one in the Chicago airport. And there was the most amazing choreographed fountain! It would go really quiet so the surface appeared flat, then shoot thin streams of water that looked like clear plastic tubes. All the water ran over the sides like an infinity pool (is that the right name?) 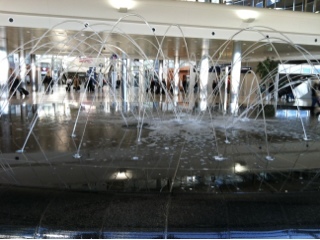 we stood there mesmerized and then the streams of water started shooting in little bursts across the fountain! It was insanely magical! When we finally boarded the plane to LAX, the lady who had been seated in the third seat grabbed her stuff and moved to the back where her friend was seated. I was absorbed in my book and paid no attention as a passenger seated herself next to me. Hours later, I looked up and we started chatting. "where are you headed?" "to Anaheim for a convention...." "me too!" and the coincidences continued as I learned that she was there because of a guest blog post I had done for Creative Imaginations using Twinkling H2Os and her product, Pearl Pens from Viva. 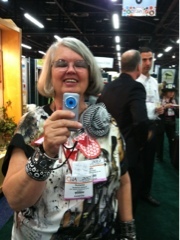 So she was exhibiting at the CI booth. I think we talked non-stop until we landed! She asked me to create some samples for her other products. Fun! And to think, if we hadn't missed our connecting flight, we wouldn't have seen the cool stuff at the Detroit airport or met this really amazing lady! 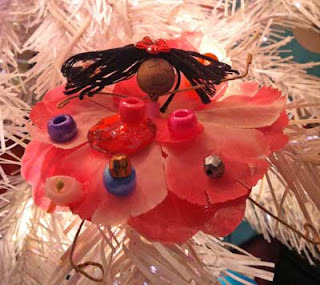 On Friday this week, I fly off to California for the CHA Winter Show in Anaheim. CHA is the Craft and Hobby Association and the show is an ginormous trade show of crafting insanity!! I am SOOO excited!! (And nervous). 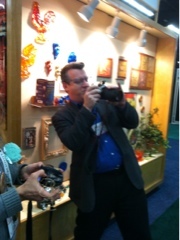 Every big craft manufacturer has a booth there and shows off the new products for the coming year. 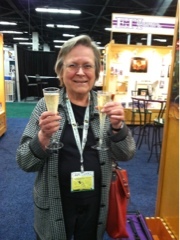 My publishers Fox Chapel/Design Originals have a huge booth and there will be a party on Monday night to honor Suzanne McNeill. She is receiving an important industry award. On Tuesday I will be doing Make & Takes and demoing in the booth. It should be a lot of fun. I hate flying, but I am focusing on how excited I am to explore the different booths. I'll be stashing ideas away for my new biz venture... And I am also excited to see my brother, Dave. I haven't seen him since my grandmother's funeral a few years ago. 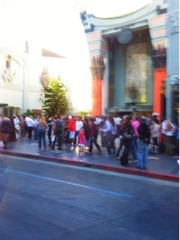 He's an animator in Hollywood - ooo la la! He was a character animator for the cartoon "Hey, Arnold!" 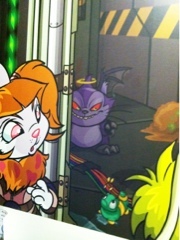 and then he got promoted and moved on to working with Neopets and kept moving up the foodchain... so now we don't actually know what he does. I am sure it is very cool though! I am also looking forward to meeting up with some other CZTs who will be out there. And, if I am lucky, I'll have time to visit the DKE toy warehouse. And maybe Kidrobot.... it's one of my dreams to have my own "Munny" type figure in a Lilah Bean shape!! Oh, how COOL would that be?! Yeah! A whole BUNCH of people have signed up for UN-Tangle!!! It's filling up (don't miss out!) Linda actually contacted The Beachmere to reserve another block of rooms. Don't freak out though - we didn't decide to accept a ton more people - it's because a lot of people actually want single rooms. I admit that I always choose a single too, when there is a choice. It is nice to be able to recharge on your own. Sounds like there are a few day-trippers too. If you are thinking about coming to UN-Tangled, but have questions, please email me or Linda Pearl (she's doing all the left-brain stuff). My name is Christy, I came from Taiwan four years ago as an art student and currently living in St. Louis, MO. One day, I went to an art store and saw your book "Totally Tangled" was right on the book case, it catches my eyes and I couldn't put down the book for 20 mins, I got so exciting about this book because I always into details drawing, tangled patterns but didn't know there have a name "zentangle". I ended up brought this book home, and enjoy each pictures over and over again, one week later, I created a piece of artwork for then boyfriend (now my husband) . I translated his name Shawn into Chinese character 尚恩, and then designed his name with all the things that he loved (cat, ocean wave, boat...) it's my first pen and ink zentangle drawing, and it's hung on our wall ever since. Since then people always ask about it and told me how much they love it, so I started to customize people's name as a gift, because I did a lot of work for people as a gift, so it's also developed my skills and getting better each time, one day there have a local juries art show, I applied for it, and it became my first art show, my journey started from there because all the link from the art show is started to unfold in front of me, I start to custom art for local gallery, have my calligraphy handmade paper items in the gift shop, and also have my Etsy shop, everything began at the moment I picked up your book. I wanted to write this mail a while ago, but I think prefer to write after I have more artwork, I want to say thank you so much for your inspiration! Valentines is on the way, so I choose two of my work ideal for couple and as a wedding gift. I drew a peacock carrying a flower in the bottom, the flower growing out with many heart shaped flowers to represent love is growing strong. The second artwork is a wedding customized artwork, I translated the bride and groom's name to Chinese character. Kelly (Above) 凱莉, Amit (bottom) 俄明 I have a butterfly fly on the left corner to represent the bride and the bird open the arm on the right corner to represent groom welcome Kelly into his life, their names surrounding by beautiful flowers to meaning in full bloom happy marriage. Thank you very much again Sandy, it's being a pleasure to share my word and art with you. Usually the image comes before the text, but I finally came up with a graphic for the retreat - so here it is! My brain usually looks this chaotic - plus a few extra ping pong balls flying around. But when I drew this tangle, I realized... hmmm... all that chaos (ideas!!) actually looks quite appealing. So I am hoping this attracts some more unusual people to come and hang out with me for a few days in one of the most beautiful places I know. There have been a few sign ups already (YEAH!!!) If you are thinking about coming to UN-Tangled, but have questions, please email me or Linda Pearl (she's doing all the left-brain stuff. The prices are based on single or double occupancy. If you are coming by yourself, but would like a roommate, please contact Linda about that too. I have no idea how that works, but it should work, and we will make it work! If you are annoyed that it is in Maine, and you would rather do a retreat with me in... say... Minnesota... then be patient for a few days and I'll give you some good news about that. If you like my books, you'll like the retreat. 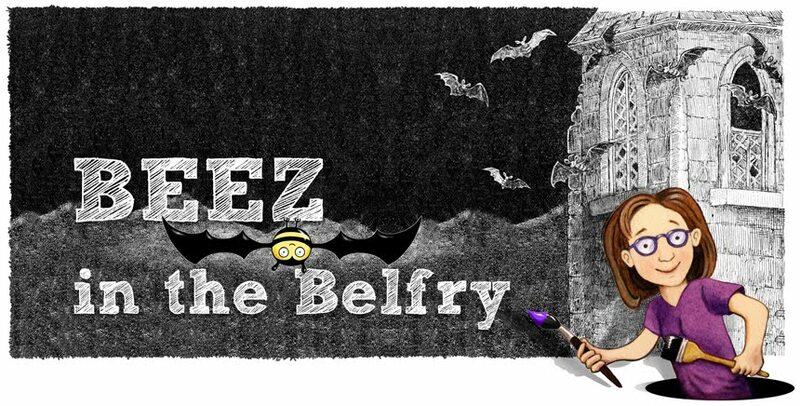 If you like this blog, you'll like the retreat. 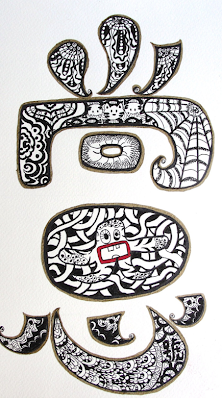 If you like Zentangle, you'll like the retreat. 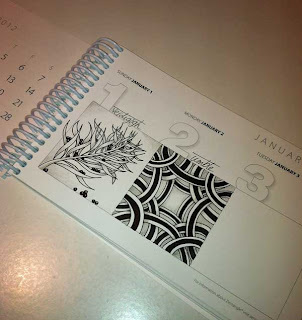 If you have never tried Zentangle, but are craving more creativity in your life... guess what? It's FOR YOU and ABOUT YOU. I just happen to be there to help you put it all together. We'll be silly, do some tangling, stay up too late, laugh some more, eat chocolate, more tangling, more chocolate... you get the idea! Sign up here: CLICK ME! This is the face I woke up to Thursday morning! 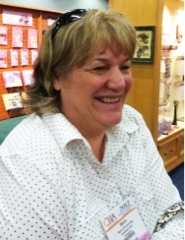 The Patchwork Pearl is very proud to announce our first retreat of 2012, which features acclaimed Zentangle® author Sandy Steen Bartholomew teaching what she does best in one of the places that she loves best. 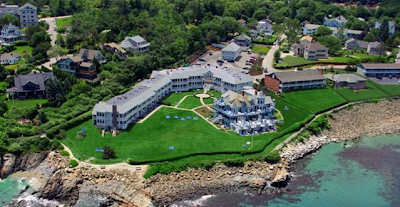 We're both very excited to be going to The Beachmere Inn in Qgunquit, Maine on March 2, 3 and 4, 2012 for UN-TANGLE, The Relaxing Creativity Retreat. 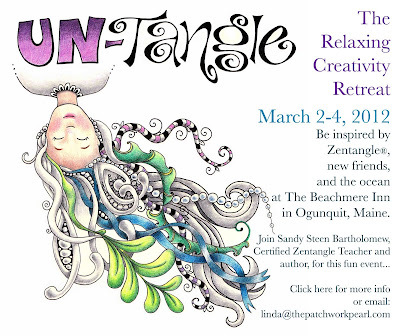 Spend a relaxing weekend tangling in Ogunquit with your host, Linda Pearl, and your teacher, Sandy Bartholomew, the author and illustrator of five Zentangle® books. Bring your own creations to show off and provide inspiration to others. 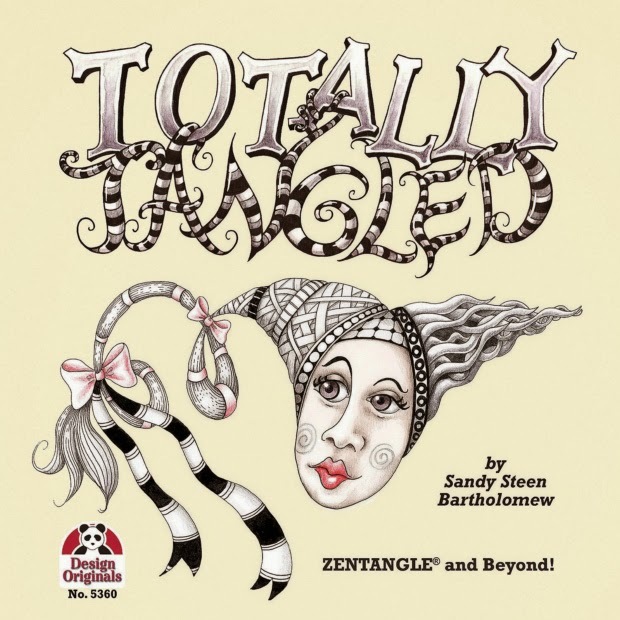 If you have never tangled before, no worries - Sandy will get you addicted in no time. Some of the areas which will be covered will include shading, deconstructing tangles, using transfers, simple printmaking and tangling on fabric. After a get aquainted session on Friday evening, Saturday will be spent working on projects and trying out new ideas. Everything will be kept in a little journal along with new tangles learned, and excercises completed. All materials needed will be provided, including your choice of one of Sandy's books. We've set aside some free time for you to feed your creative soul by walking Ogunquit's beautiful Marginal Way (the cliff walk along the ocean). Sandy will be available throughout the weekend to provide you with feedback on your tangles as well as allow you to pick her brain. She will also have a small shopping area, which will showcase some of the products she's come to know and love on her journey. The 'almost' all-inclusive cost for this weekend is $375.00 per person/double occupancy, and $565.00 per person single occupancy. That includes 5 meals (Friday night, Breakfast and Dinner on Saturday, Breakfast and Lunch on Sunday) and Sandy's getting started kit. We've set aside some free time for you for lunch on Saturday afternoon. We suggest either walking Ogunquit's beautiful Marginal Way, which has several shops and lunch stops at either end, or perhaps taking advantage of The Beachmere's luxurious spa facilities. Lunchtime Saturday will be on your own, and we'll get back together to see the fruits of your creative lunch mid-afternoon on Saturday. We really have a lot of fun time planned for you, so please come and enjoy a weekend playing with your creative side. Register today so that you can take advantage of Sandy's first retreat in Maine. New Year's Resolutions already a burden? Yeh, me too. 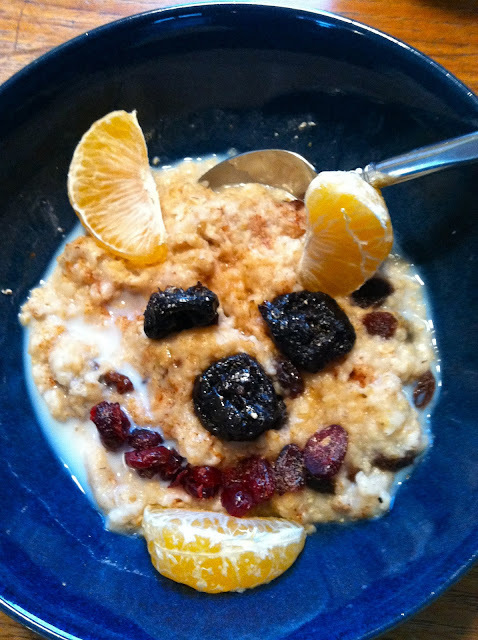 I signed up for an online personal trainer to help me figure out food and exercise. But the grocery list alone is impossible and I don't eat any of the foods on there and I don't have time for all the exercises never mind watching all the videos to see how to perform them... It's a failure and wasted money before I have even started. Sigh. This calendar is gorgeous-ly design-y with enough of Carole's own artwork to provide inspiration. Each day has a box (and a number) that can be filled with tangles. [Of course, you could use it as an actual daily planner too.] The paper is smooth and a pleasure to work on, shades well, and doesn't bleed through (at least with the traditional Micron pens). Each day's box is big enough to work in comfortably, but small enough that it doesn't take more than a few minutes to feel successful. And it is very portable. I'm going to concentrate on just doing one type of tangle in each box, but you could make up your own challenges like... perhaps one tangle in the left box, one in the right, and then a combo of the two in the middle? Hmmm... I might try that tomorrow. This is exactly MY kind of exercise! Now all I need is a Zentangle-method of eating right! This photo was taken 2 days ago. I have actually been keeping up! 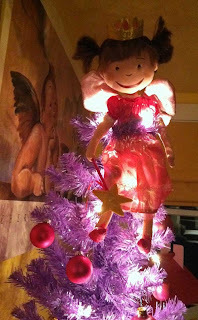 It feels like I was just blogging from Ogunquit that I needed a sabbatical until the new year, and... WHOOSH!! It's the New Year! What the heck happened?! 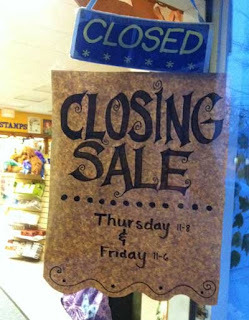 Well, in all fairness, I had not intended to spend the time-off shutting down my store! That kind of came out of the blue. We can talk more about that on another day. 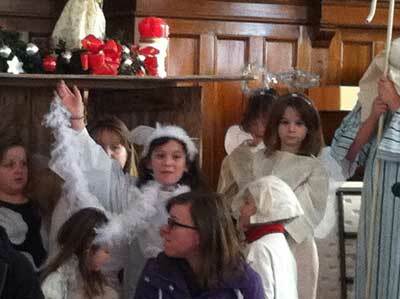 Christmas Pageant Rehearsal. Yes, that sweet looking little angel on the right is my Lilah... this photo captures the only time she was actually on stage. She became known as the "Angel in the Outfield". She threw a noisy fit just before the real production, that night, and spent the entire time running laps around the church. When it was all over she was the perfect child handing out tiny gauze bags that she had spent the afternoon filling with teeny glass hearts. 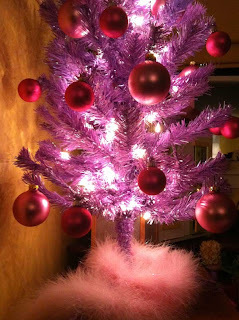 Perhaps the spirit of Christmas IS all about giving? Her brother, on the other hand, was supposed to be the director for the play. HE had spent the past 24 hours puking, so we just left him home until the last minute. Ah, drama. 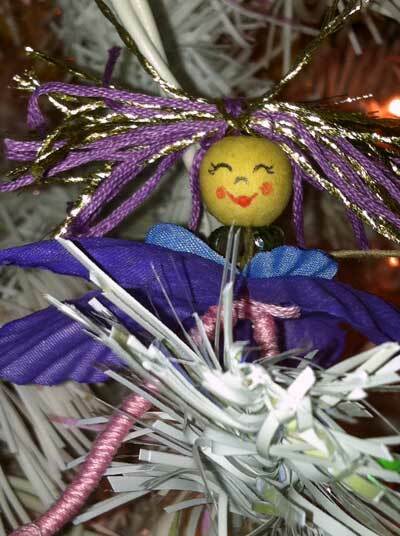 Lilah and I made a handful of fairies for my "last-minute" tree. All my Christmas spirit was spent emptying out the store. The sale went really well and a few of the people who had taken donations for their groups showed up to help box-up the remaining inventory for World Vision. (Thank you. THANK YOU!) 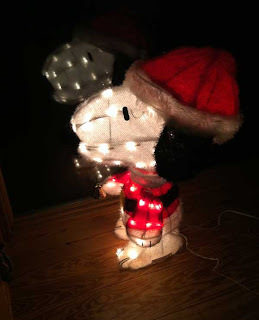 It was all SO crazy that it wasn't until Christmas Eve, when I suddenly realized I was all alone. Gulp. 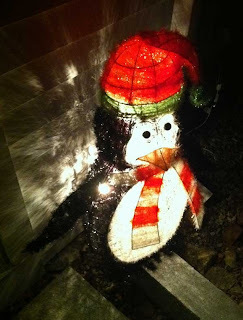 I've always felt Xmas Eve to be a very lonely time, but this was the first I had ever truly been all alone. Just me and Snoopy. I will never, NEVER let that happen again. Sunday wasn't quite as bad because my mother came over and we opened the presents we had bought for ourselves, very slowly. Also a first. I got the kids back on Wednesday and we proceeded to combine all the winter holidays into one. 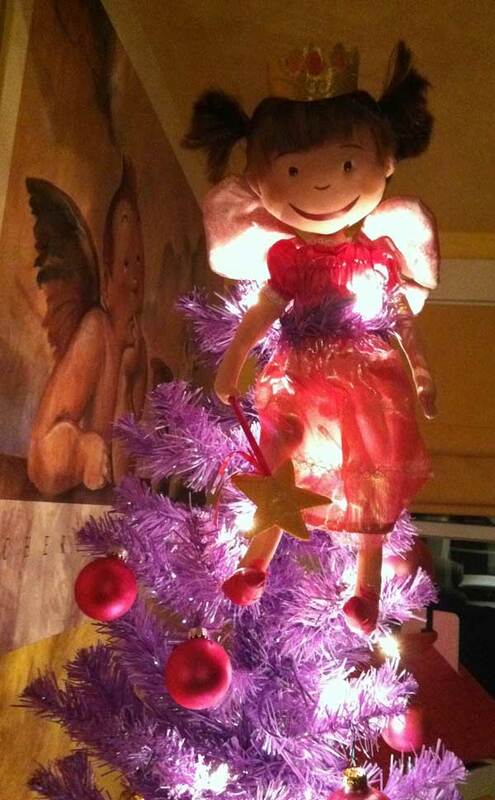 I had set up a purple tree in the living room with Pinkalicious strapped to the top as our angel. It looked really pretty! Until one morning... I was fast asleep and my son yelled, "Mom, three bad things. The cat knocked over the tree and the balls are smashed all over the floor. She threw up all over the rug... and I have a doctor's appointment in 15 minutes." Bah humbug! I rebuilt after the cat-astrophe. Minus a few glass balls. Our New Year's Eve-Day was also our Christmas morning. 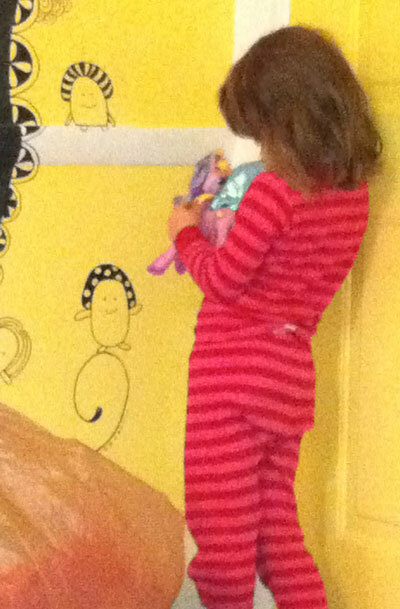 Lilah got a Time-Out. (And a my Pretty Pony). 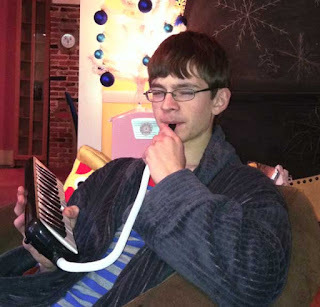 I always get my son an unusual musical instrument for Christmas. This year, it was a Melodica. A weird little piano type thing that you blow into. Yes, it IS a real instrument. When he first tried it out, it sounded like a traffic jam. But within a half hour, he had figured it out and said something about "tongue-ing" (I don't really want to know). He could make it change from sounding like an organ, to a bagpipe, an accordian to a flute! It was magical when he played the Dance of the Flowers from the Nutcracker and it could play the flute-y bits at the same time as the organ-y bits. You know the "doodoo-doo-doo-DOO-doo" parts? I was really impressed. He played with it for hours and we finally banished him to the music room, with the doors CLOSED. I think I have mentioned before that teenagers are like vampires - they don't show up in photos? I did catch one of Alex (above) but he always seems to close his eyes in pics lately. He must believe that if he can't see me, then I can't see him? Lilah, on the other hand, is always out of focus or wrong end up, in my photos. She is constantly vibrating and as hard to capture on film as a hummingbird. My new Tangled Fashionista book is due soon. 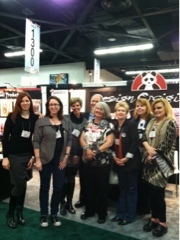 I'm going to CHA in Anaheim to demo in the Fox Chapel/Design Originals' booth. A big workshop for 40 parents and kids at Concord Public Library. Brainstorm new ideas for a new biz to take the place of Wingdoodle. Playing around with the idea of re-starting my stamp company. Oh! 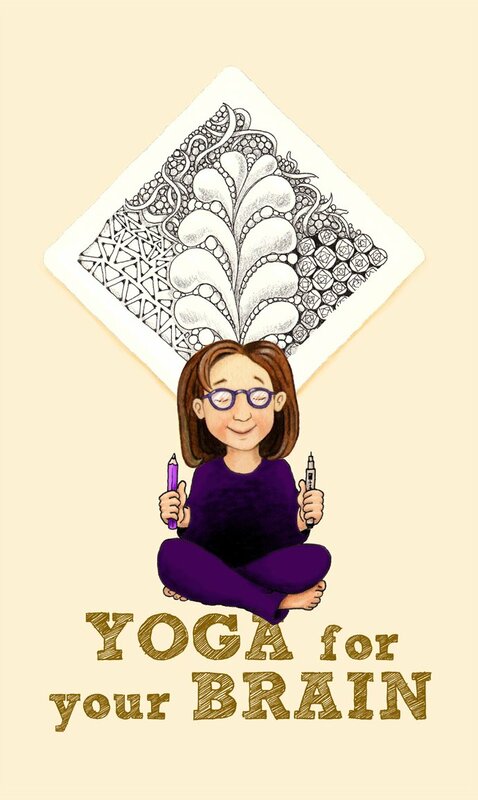 And I'm doing a Zentangle Retreat in March up in Ogunquit, Maine!